I have a 10 gallon tank with one male Betta. He looks kinda small in there. There is all this info on the net about divided tanks, but they seem not to be long term things even though people seem to claim that they are. We have Lexam <likely Lexan> here, it is 1/8th thick and a Plexiglas type thing, but people say that silicone doesn't adhere well against glass. Re: 10 gallon tank with filter vs. 1 gallon tank with no filter Thank You! - Interesting scenario: We just returned from the fish center at Petco. The woman at the fish center seemed to be knowledgeable and told us it would be much better for our Betta if we kept him in a 1 gallon tank with no filter and just do water changes every week. She said the fish would be less stressed and live much longer. We currently have our Betta in a 10 gallon tank with a filter. Is this woman correct? <Please try/use the search tool (on all pages), WWM is not a chat room, but an information resource. Just wondering if there is a point where a tank is just to tall for a Betta. I saw a used 16 gallon for sale, but it is 19 inches tall. Is that too tall? tankmate choices. 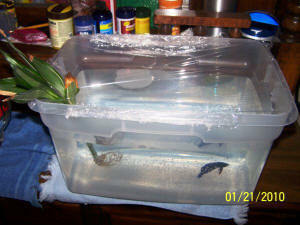 Alternatively folks can arrange some sort of device w/in these larger tanks to house the Betta. I have a 29g freshwater tank. I keep it at 78F to accommodate both a Betta and 5 julie Corys. 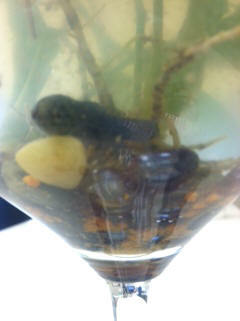 My tank cycled 40 days, no traces of ammonia or nitrite, nitrate is low, am carrying out 20% water changes twice a week. Introduced my Betta, he's doing fine... loves it! Swims around, checks everything out. 18" is to<o> deep for a Betta, sometimes they forget to breathe. I asked her when the last time she forgot to breathe was? After a brief discussion, she thanked me for correcting her on what Petland has told staff for years 'at this particular location'. Anyhow... I introduced my 5 Corys two weeks later, and they are also doing awesome. I've had the Corys for two weeks, and am thinking of my next additions... my little girls want guppies. I want color. Is there any issues of adding 3 female guppies, and then adding 3 female swordtails? Would the Betta, Corys, guppies and/or sword tails work well with 2 African dwarf frogs in a month or so? 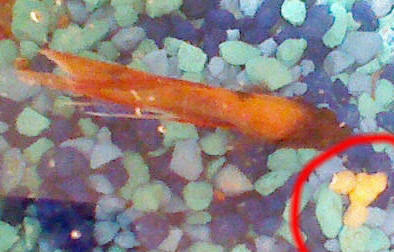 My wonderful wild caught pureblood Betta stiktos is stupid. It jumped out of a perfectly clean tank (where I am keeping happy neon tetras) and is now fairly dry. I picked it up and put it in water fast. Is there anything I can do to help it? I read somewhere opening the gills will help. Is that so? I need the answer 5 minutes ago lol as from what I know, seconds count. She died. :( I have a lid, but there's a hole by the filter. She was fairly dried, but the tail wasn't completely dry. Gills weren't moving and I couldn't get them to. I bet she was just past recovery. Thanks!!! Re: Need help ASAP. Reviving my potato chip. My brother has a beautiful reddish Betta fish that he keeps alone in a relatively large, circular bowl. She is active, eats well, and is presumably very healthy. I just went to clean out the bowl, and at on top of the rocks at the bottom there is a skin-tone bubbly-looking mass. It looks to be about 3 cm wide and 1 cm tall. It consists of three solid tone circles that look as if they melted together in the center, and two transparent tone bubbles of the same peach color on either side of the solid toned mass. There appears to be nothing inside of it. I want to know what it is before I clean it away, because I fear it could be a sign off some sort of illness. I've also included a picture of the mass (it is circled in red) and I can tell that it is definitely not a rock. Please respond as soon as you can! This fish needs, at minimum, a 4-5 gallon aquarium, a heater, and a filter. Hello I am a new comer to the world of Betta fish! I was wondering if it would be safe to keep him in a vase that is about 3/4 of a gallon? <No picture attached but I can tell you if it is a vase and not a tank at least 5 gallons it is unsuitable for a Betta. Like all tropical fish they need a heated, filtered, roomy tank. Please see here for more. Thank you for your helpful response to our outdoor Betta spp set up/pond question for a tropical climate! Just need a couple more points of clarification. The pond or ponds that we are considering would be in the range of 40 gallons to a few hundred gallons. They will definitely have floating plants. With regard to male Betta spp, you mentioned that they need at least 30cm of surface territory to prevent fights (something we would need to keep an eye on!). Is this also the case for females? Do they carve out territories as well, but smaller areas compared to males? Another thing is about the jumping; floating plants I'm sure will help here but do you have any suggestions on how far down from the pond edge the water level should be? Since we haven't started the project yet, we can go ahead and plan for fish that are prone to jump. I was wondering if it is ok to put two male Bettas in a divided tank if there is a filter on each side. I have one Betta in there now with two sponge filters. One of these filters is for "up to 40 gallons" the other for "up to 10 gallons" My husband has a piece of Plexiglas that he drilled about 25 little holes in for the divider. Is this a bad idea in the long run?? Thank you!! Someone on the internet said that if a Betta is in a too tall tank they will develop swim bladder problems, plus stress when it comes to going to the surface for air. Is this true concerning the swim bladder problems? Also I have a 20 gallon tall that I may put one Betta in with no other fish. The tank is 16 inches tall, so even with a half inch or an inch of gravel, is that too tall for a Betta?? or is 12 inches the max?? Thank you! I was wondering if it is possible to build a five gallon tank for a Betta with regular glass that they have at the hardware stores. Or do you need glass that is thicker than that even for a tank that small? Thank you! mix, along with the safety issues, and the choice becomes a no-brainer. Greetings to the WWM crew! I found your site a few days ago and have learned a huge amount from it already. It's great to have such a wealth of information in one place, and I read as much of it as I can during the day. My question is this: I recently bought a five gallon Aqueon MiniBow aquarium for my office desk into which I intend to add a male Betta and perhaps a couple of snails or bottom feeders for cleaning up. I bought some smooth gravel for the bottom, a few ornaments with hiding places and a couple of live plants to aid the water and bacteria cycle. I also bought a 50w Marineland heater which keeps the water at 78-80 degrees very nicely. I filled it up a few days ago and let the filter run with a recommended dose of water conditioner over the weekend. I also took some gravel from my sister's 20 gallon Betta tank to get the cycle started. I intend to bring a sample to my local fish store to test before introducing any fish. I have a few questions. What is a good bottom feeder to add in to help keep the tank clean? <Adding animals doesn't clean the tank. That's the job of your filter! I have read anything from snails to ghost shrimp to Cory catfish. My sister has a few Corys and they seem very excited and never calm down. I have a feeling that would stress out my Betta in a smaller five gallon tank, which is why I was thinking more along the lines of a couple of snails or other feeders. What do you recommend? My second question is, the filter in this Aqueon tank seems to move the water a little too much for a long-finned fish like a Betta. Are there smaller or gentler filters (such a sponge filter) you could recommend? With bottom feeders, is there any need to vacuum the gravel every now and then? I plan on 25% water changes every two weeks, but I don't want the risk any of them getting sick because of bacteria under the gravel. Thanks very much for your time, and please keep up the great work! Thanks very much for the reply! I checked the tank for nitrate, nitrite and ammonia levels for 3 days, and all were at ideal levels. I introduced my Betta and 4 Ghost shrimp after ensuring that everything was ready. He's mostly been floating above the thermometer, (please see attached pic labeled "after") and I've noticed that he has a white spot next to his gill now. It's only on his left side. He also isn't eating very much. 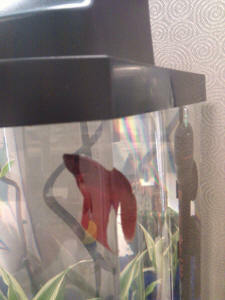 I feed him Betta pellets, and have some freeze dried bloodworms on the way in the mail to try. He'll look at them when I drop them in and even swim over to them, but then just takes a gulp of air and goes back to his spot over the thermometer. 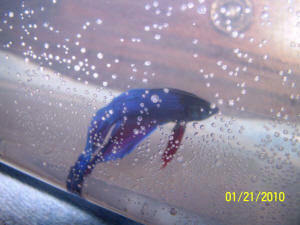 <Your Betta is one of the fancy varieties created by humans. These can't swim well. They will always rest in sheltered spots at the top of the tank. If it is Ich, I know I can just raise the temp of the water. Will the Ghost shrimp tolerate 85 degree water ok if I do this? I took care to prepare everything very well, and I'm concerned I did/didn't do something that I should have. I see now what happened. I thought since there were a couple of fish in here previously that the cycle had already come and gone. Perhaps the cycle hadn't completed. The test strips I got are apparently not very accurate either from what I'm reading. Can you recommend a better water testing method? What about those ammonia gauges that stick to the side of the tank and tell you when ammonia is at dangerous levels? I did a 50% water change this morning with treated water (making sure it was at the same temp as the tank water) and he seems to be swimming around a little bit more, (perhaps just from the disturbance of changing the water) but he still won't eat anything. If you think it's the ammonia level making him sick, how often should I do partial water changes, and what % of the water should I change? <For the first, let's say 3 weeks onwards, change 20-25% every day or two. Hopefully the sponge filter and bloodworms will entice him to eat something soon. The shrimp, meanwhile, are scurrying around picking up anything they can and eating it. Sorry for my noob mistakes and questions. I'm sure you guys are shaking your heads at most people who ask these questions. recommend using an opaque divider in a tank with male Bettas. My two males, Whirly and Zi, flared at each other for exactly 5 days after Zi was added. On the sixth day they basically could care less if the other was in sight. And other than a random flaring contest they are quite content to just swim around their section of the tank or even odder they at times "snuggle" with the divider between them. I get the feed me dance. 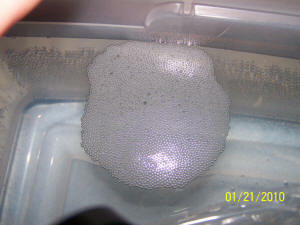 They are building bubble nests. Just very interested in the world around them. Yes, I have a tendency to have oddball animals. I recently sent in a query about the endless problems with my tiny 6 gallon Fluval Edge (I'm a beginner, big mistake), and Neale set me straight on a few things. Blunt but fair and very informative, thanks Neale. My surviving 4 guppies and 2 platys have been re-homed to a new enormous tank, so hopefully they are now much happier and healthier. I spent some time deciding whether or not to sell the Fluval and get something bigger - but I have limited space available, so upgrading to a 90 litre isn't a viable option. And after 10 months of struggling, I'm hooked anyway! So, with all its design flaws, pathetic size and danger to beginners, I only have the Edge for the time being - I may be able to upgrade to 40 or 50 litres soon. aqua body, and blood red fins. He's very beautiful and has a strangely expressive face! Based on what I've read so far, a single Betta in a 6 gallon heated, filtered tank is acceptable isn't it? <Yes, but the problem is that the Edge has a square "slot" at the top rather than the whole top being open. 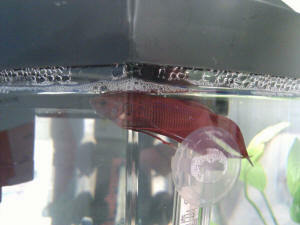 Since Bettas need to breathe air, they have to aim for that small slot each time they want a gulp of air. Yes, there is some debate over the effectiveness of gas exchange in this tank, but the design is also very poor in light of the Betta being a surface breather. So I have left a 5mm gap at the top of the tank, giving the fighter more breathing options (i.e. the whole surface area) rather than just the 7" x 6" open aperture at the back. and I also added a Zebra Snail which is already doing a great job. even if they could all get along with the Betta, I would need several of each to meet their social requirements, and that would be way too many for this tank, right? So, what about just a small species of Cory? From what I read, these could be a suitable addition, being armoured bottom dwellers etc....but I do of course have very limited space. I guess 2 would be ok in terms of the tank size, but too few in terms of their preferred group existence? I'm very tempted by the Panda Corys I spotted at the shop, but presumably I cannot support 4 of them? Even if I could get away with adding only two, is it possible to compromise between their respective preferred temperatures - it seems that the Betta likes 26-28c, but the Corys prefer lower temps of around 22c. Could they all be comfortable at, say, 25c? Alternatively, I could go for some different species of shrimp and snails to add variety, if this wouldn't increase the bio-load too much.....any suggestions, as there seem to be a vast number to choose from? Would very much appreciate your advice, thank you. tank which must've hitched a ride on one of the plants....not quite what I had in mind, but good for the gravel I guess. I keep it all fairly clean, so hopefully I won't find a billion of them one morning. A different rep at the fish shop yesterday told me he kept 25 dwarf barbs in an Edge with no problems'¦'¦. but that the lights are rubbish for plants. Jeez, its no wonder I get confused. Stay cool, and cheers for all the expertise. Two photos of Maximus are attached. In both he is prowling his holding-jar; in one of them the lower-portion of his aquarium can be seen in the background... now being "cycled" by eight Minnows. ....Michael, proud sponsor of Maximus the Betta.